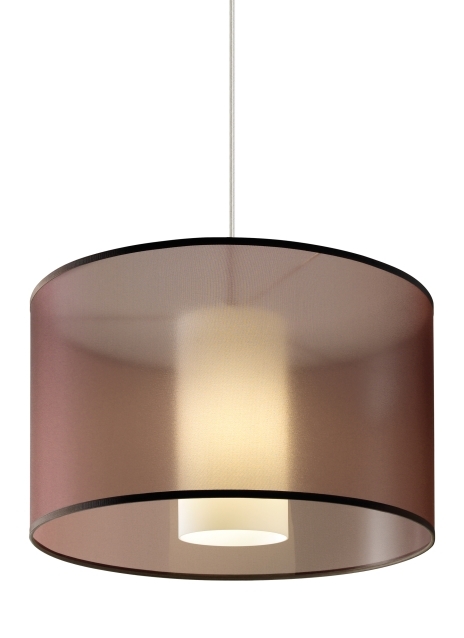 The Dillon pendant from Tech Lighting features a beautiful translucent organza drum shade that surrounds an inner glass cylinder. Soft light is emitted onto surfaces below by the glass diffuser at the center of the shade. The Dillon pendant is available in two classic colors, brown and white and ships with your choice of incandescent or energy efficient LED lamping, both lamping options are fully dimmable to create the perfect ambiance for your special space. Scaling 20” in diameter and 12” in height the Dillon is the perfect contemporary pendant for use as dining room lighting, living room lighting as well as countless commercial lighting applications. Rated for (1) 75 watt max., medium base lamp (Lamp Not Included). LED includes 120 volt 9.5 watt, 800 delivered lumen, 2700K, medium base LED A19 lamp. Fixture provided with six feet of field-cuttable cable. Dimmable with most LED compatible ELV and TRIAC dimmers.